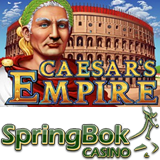 Players at the deluxe Springbok Casino are receiving free spins, free money and double comp points as they take a spin at the South African online casino's Game of the Month for May, Caesar's Empire. Caesar’s Empire is a five reel, 20 payline slot game from Realtime Gaming (RTG). The Caesar Coin symbol is wild and triples the pay out. On a R20 bet, 5 Cleopatra symbols wins the jackpot of R2500. Five Cleopatras during free spins wins R5000 on a R9 bet. Ten free spins are triggered when a Coliseum appears on reel five and one or more Caesar symbols appear anywhere else. All Coliseum symbols change to Caesars or Cleopatras during free games and every Caesar awards up to five extra games. “Sometimes it seems like you’re playing on free spins forever!” said one regular player. You'll automatically earn comp points when you play any of the hundreds of games at Springbok Casino. This month, with double comp points on Caesar’s Empire, earn points twice as fast! To claim a 100% up to R2000 Caesar’s Empire Deposit Bonus enter coupon code CAESAR2000 when you make a deposit. To get 10 free spins enter coupon code CAESARSPINS. These bonuses are available until May 31, 2014 only. Fourteen of Springbok's most popular slots are also available in its mobile casino for iPhone, iPad and Samsung Galaxy S3/S4 users.